Information limit of a microscope. The information limit is defined as the highest spatial frequency transferred to the image with statistical significance. Assuming we are imaging only two columns of atoms separated by a certain distance, under some condition they show up as two separate spots in the image. If the atom columns were moved closer to each other the two spots in the image would also move closer to each other until the distance between the atoms is too small for the microscope to resolve and thus only one larger spot would be observed. This distance between the two atom columns is known as the information limit of the microscope. For real TEMs, the phase contrast transfer function is limited by a number of factors: i) Variation in electrical currents in the lenses; ii) Variation in accelerating voltage and gun emission; iii) Attenuation in the CCD camera; iv) Slightly nonparallel illumination; and v) Specimen drift and vibration. All these limits can be described by envelope functions, E, which will gradually dampen the phase contrast transfer function and eventually reduce it below the noise at some spatial frequency. The first three factors depend on the inherent properties of the microscope. For all modern microscopes this significant decrease happens at higher spatial frequencies than the point to point resolution and defines the information limit of the microscope beyond which no information is transferred at all. Figure 3715 illustrates the difference between the point resolution and information limit in TEMs. Figure 3715. 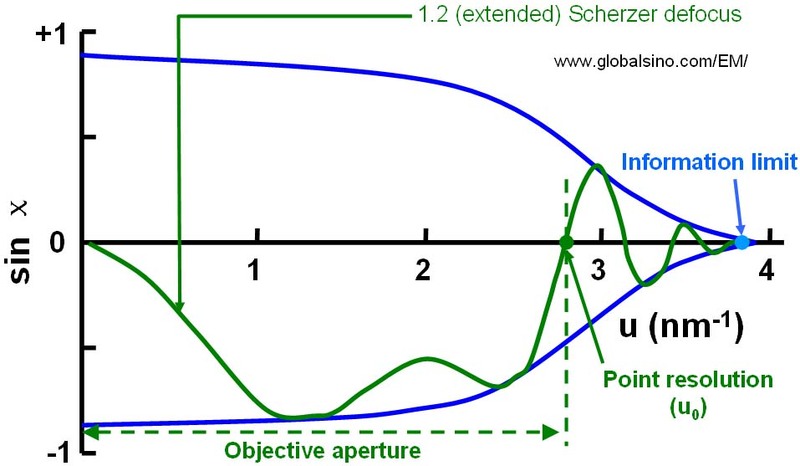 Schematic illustration of the difference between the point resolution and information limit in TEMs. Note that in imaging mode of electron or optical microscopes, the point spread in an imaging plane is determined by the information limit.